It must have been pretty weak pixie dust, that debt ceiling agreement that was supposed to stave off imminent collapse, put America on a sound economic footing and bring sunshine and joy to the democratic peoples of the earth, because its affect on the mood of the world's stock markets lasted about thirty two seconds. Economic anxiety should be our final reaction. America’s current problem is much more a jobs and growth deficit than an excessive budget deficit. This is confirmed by the fact that a single bad economic statistic more than wiped out all the stock market gains from the avoidance of default, and the fact that bond yields reached new lows at the moment of maximum apparent danger on the debt limit. In fact, there are some fundamental contradictions at the heart of the American - not to speak of the global - economy that make it nigh impossible to restore growth using a tool so blunt and simple as cutting public sector debt - something that the present debt ceiling deal doesn't do in any case. Mostly what the shabby compromise does is cut stimulus spending enough to depress the economy without actually eliminating the debt load in the public sector of the economy, thereby freeing it up to provide stimulus spending. The rich will continue to have their tax breaks - notorious for not providing any economic stimulus whatsoever - but everyone else is too broke to spend money, worried that their house will face foreclosure, that they will lose their job or suffer a pay cut. In fact, just as the politicians in Washington are debating how much to slash spending, foreclosure rates continue to rise - the crisis is anything but over. Lenders are poised to take back more homes this year than any other since the U.S. housing meltdown began in 2006. About 5 million borrowers are at least two months behind on their mortgages and more will miss payments as they struggle with job losses and loans worth more than their home's value, industry analysts forecast. never rising above 5 percent after 1985. 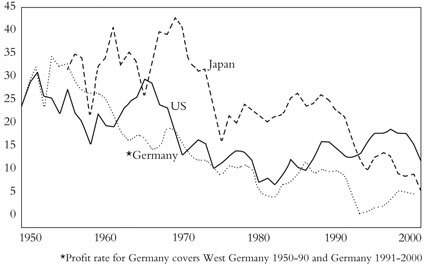 Profit rates did recover from about 1982 onwards—but they only made up about half the decline that had taken place in the previous period. 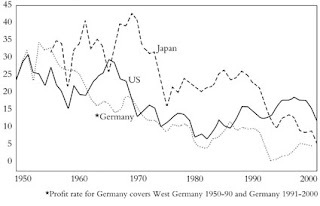 According to Wolff, the rate of profit fell by 5.4 percent from 1966-79 and then “rebounded” by 3.6 percent from 1979-97; Fred Moseley calculates that it “recovered…only about 40 percent of the earlier decline’’; Duménil and Lévy that “the profit rate in 1997” was “still only half of its value of 1948, and between 60 and 75 percent of its average value for the decade 1956-65”. 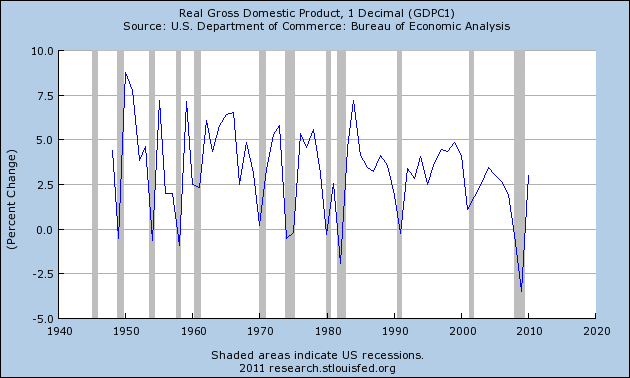 The decline in the rate of profit had some very clear impacts in terms of economic growth. 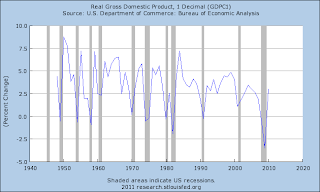 It meant, on the one hand, that growth in GDP - the total domestic production of the US economy - never went above five percent from about the mid-1980s (see chart above). It also meant a slow decline in industrial utilization, as factories never reached their full capacity. Financialization can be defined as the long-run shift in the center of gravity of the capitalist economy from production to finance. This change has been reflected in every aspect of the economy, including: (1) increasing financial profits as a share of total profits; (2) rising debt relative to GDP; (3) the growth of FIRE (finance, insurance, and real estate) as a share of national income; (4) the proliferation of exotic and opaque financial instruments; and (5) the expanding role of financial bubbles. In 1957 manufacturing accounted for 27 percent of U.S. GDP, while FIRE accounted for only 13 percent. By 2008 the relationship had reversed, with the share of manufacturing dropping to 12 percent and FIRE rising to 20 percent. The upshot is that no matter how many panto plays the politicians in Washington put on as long as the weight of the economy continues to weigh more heavily on the financial sector, it will be unstable. It appears from the spreading "debt crises" that a tipping point has been reached where debt threatens to paralyze the ability of the European and American economies to restore growth. However, the irony is that the focus on debt will only result in a painful and further destabilizing shift from public debt to an already bloated private sector debt. In the US the aggressive rise of the Tea Party model of economic policy - eliminate all borrowing as quickly as possible - will itself only exacerbate the problem as growth goes into full reverse, tax revenues fall, and debt levels rise. If they manage the unlikely act of passing "balanced budget legislation" this will create a positive feedback loop where lost tax revenues lead to more debt which leads to more cuts, leading to slower growth, leading to lower tax revenues. On the other hand, the attempt to put off dealing with the debt for another day will simply delay the inevitable. Ultimately, the system needs a reboot - the debts should be cancelled, the banks nationalized and national investment geared towards building a real economy of infrastructure, green industry, and providing healthcare, decent housing, education and quality food to all.